Disney’s Newsies makes an exuberant transition from the silver screen to the Broadway stage, taking elements from the original 1992 film version and expanding them into a powerful statement about how dauntless spirit can achieve economic justice. Intact are the mighty songs by composer Alan Menken and lyricist Jack Feldman, who won 2012 Tony Awards, as did choreographer Christopher Gattelli. Harvey Fierstein contributed a new book that had audiences clamoring for tickets, making Newsies the highest-grossing show of the 2011-2012 season, with a phenomenal 1,005 performances, when only a hundred were planned. This touring production, currently at Shea’s Performing Arts Center through October 4 (tickets: 1-800-745-3000 or Ticketmaster.com) is a winner, led by the indefatigable Dan DeLuca as Jack Kelly, the ace seller of “papes,” as newsies call what they hawk on street corners. Though wanting to move beyond his constrained life in New York City, Jack evolves into a galvanizing leader of a strike by the newsboys that actually happened in 1899. At his side are new recruits, Davey (Jacob Kemp) and his younger brother Les (played by Jonathan Fenton in the performance I saw), who, having a better education, help Jack to phrase the rhetoric, organize the boys, and encourage him to confronts publisher Joseph Pulitzer (Steve Blanchard). Substituting for the film’s reporter Bryan Denton is Katherine (Stephanie Styles), which introduces an early love interest to the show. Jack is also endowed here with artistic talents that we see in the scenery he paints in the vaudeville house run by the Medda (the magnificent Angela Grovey). That plot point, at first an apparent red herring, becomes the pivot around which the show resolves. The two-hour production conflates much of the film’s last half into a tighter if somewhat hyperactive second act that brings the show to a boisterous close. 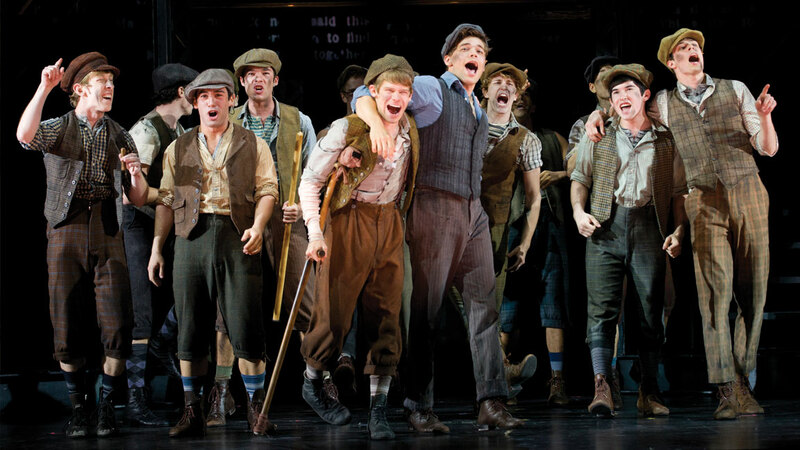 The dozen-plus newsies sound, move, and have the energy of a chorus twice that size. The show’s set, which feels like we’ve fallen into some kid’s Erector Set, admirably supports the action and quick scene changes, enhanced by motorized shades on which pertinent graphics are projected. Such a device would have softened the look to the box seats in Medda’s theater, and there were several problems with audio feedback during the show that I’m sure will be ironed out for the rest of Newsies run. One curious difference between the film and theater versions is the treatment of Pulitzer’s ethnicity. The chorus is very diverse, and a few stock characters—an Italian barber, a Jewish café owner—make brief appearances. But missing is the vocal accent expected of Pulitzer, who was in essence a mercenary when, at 17, he was recruited to fight in the Civil War. This paid the passage to these shores of a Jewish-Hungarian immigrant who became one of the wealthiest and most influential men in the US: owner/publisher of the St. Louis Post-Dispatch and the New York World, later elected to Congress, and whose legacy includes the founding of Columbia University’s School of Journalism and the annual award recognizing excellence in journalism and the performing and literary arts that bears his name. His rags-to-riches story was emblematic of the American dream. Yet this production makes him sound like any well-educated WASP businessman. His achievements will, probably, be emulated by some of the newsies themselves, but that connection wasn’t emphasized. The larger context relates very strongly to our society’s current situation: Newsies is set in the Gilded Age, when oligarchs (like Pulitzer) colluded to create monopolistic trusts. We learn Pulitzer has corralled his fellow publishers to do what needed to be done—all raising the cost to the newsies who truly were the vendors of the news, and keeping the story of the boys’ mass meeting out of every paper (“If it isn’t in the papers, it didn’t happen,” Pulitzer tells Jack) to kill the strike. Eventually, Pulitzer relents and negotiates a deal with the newsboys, but only after Teddy Roosevelt, then governor of New York, puts the pressure on (a potent argument for how government must have a role in a free market to make it work for everyone). Newsies is a paean to labor organizing; the newsies work hard and are proud of their job (keeping the city informed); they just wanted to be treated fairly. The present era isn’t much different: computer coders being laid off, only to be hired back as contractors, as are Fed Ex drivers, without benefits. The applause for Newsies at the curtain should be recognized as being a rousing endorsement of both the boys’ struggle for justice and a superb piece of musical theater.